The Hungarian Ramblers’ Association accepted the idea of the Blue Trail, and gave it to a committee to plan the exact route in 1930. Two teams started in opposite directions from the two ends of the Blue Trail in March 1938. The two teams met on the top of Dobogókő Mountain at Pentecost. 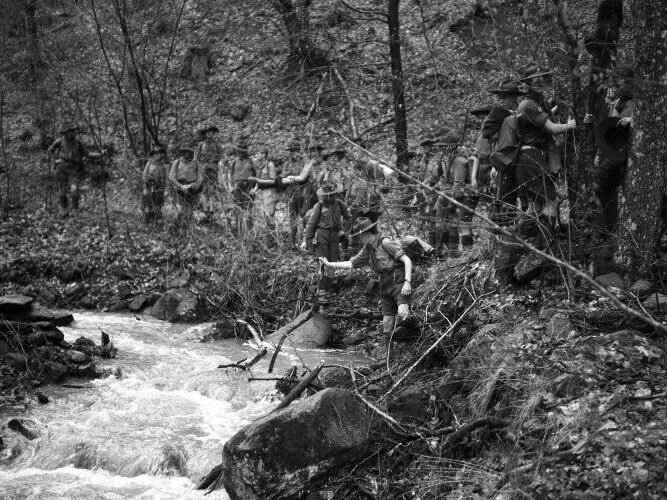 The popularity of the Blue Trail Movement had been growing continuously in the previous century among the Hungarian hikers, pioneer and scout teams. 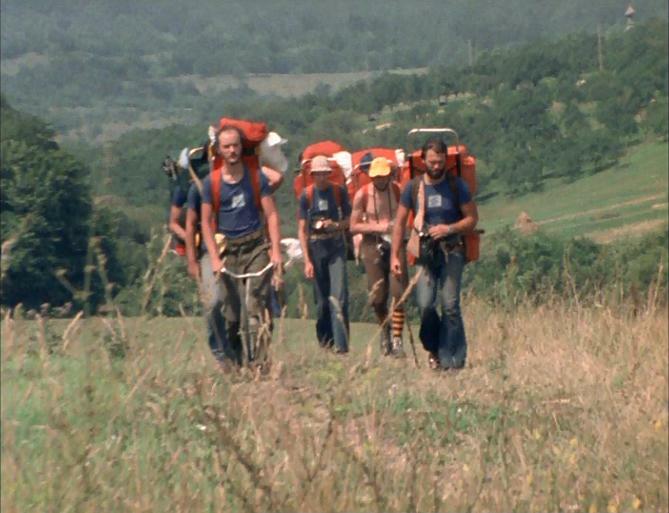 A TV crew decided to perform this hike during a two and a half months long continuous walk in 1979. The TV series made the Blue Trail known among the Hungarians. According to the record of the Hungarian Ramblers' Association the popularity of the Blue Trail has been growing continuously. The number of completions exceed the 200 first in 2012. The route of the National Blue Trail on three different maps. Two of them were issued in 1938 and 1964. The last one contains my GPS track projected onto a map of Hungary. Mr. Gábor Strömpl presented his proposal about the standardised marking of the hiker paths in the former hikers magazine named Turistaság és Alpinizmus (Hiking and Alpinism) in June 1929. He was a geographer, the teacher of the Honvéd Térképészeti Intézet (Cartography Institute of Defence) and a pioneer of the Hungarian hiking. This article made big waves among the hikers, so the Magyar Turista Szövetség (Hungarian Ramblers’ Association) decided to found a committee to judge about this idea, and Mr. Strömpl was a member of that. Later, in December 1929 the Association accepted the plan of the committee about the standardisation of the different types of signs and decided to paint the standardised hikers signs in the next five-ten years. We have been using this system since this time, it isn't a simple one, but it serves with many information for the hikers! You can find a short description about the system in the General information chapter. But Mr. Strömpl extended the plan, and presented his idea about a long distance path. According to his plan one long distance path should connect the local nets of marked paths of the different mountains and counties. This long distance path should lead along the Transdanubian Mid-Range Mountains and the Northern Mid-Range Mountains from Kőszeg town until Sátoraljaújhely town. The Hungarian Ramblers’ Association accepted this idea, similar to the standardised marking of the paths, and gave it to another committee to designate the route of this long distance path. They finished this work and handed over their proposal to the Chairmanship of the Hungarian Ramblers’ Association in May 1930. The plan was born already, but the execution of the plan wasn’t an easy thing! For example the originally planned colour of the signs was the red strip, a hikers’ association was made the painting at the Balaton Lake between Tapolca and the Badacsony Mountain with this colour, but a longer section of the planned route was marked already with blue strip in the Cserhát Hilly Country, so the Association changed its decision, and the final colour of the new trail was the BLUE! There were different ideas and plans about the name of the long route, but the Association postponed the decision until the finish of the painting work. The painting of the trail marking lasted until 1938. There were problems with the route because of the prohibited areas and with the connection points of the trails of the different counties, but the 80% of the route was already marked in summer 1937. 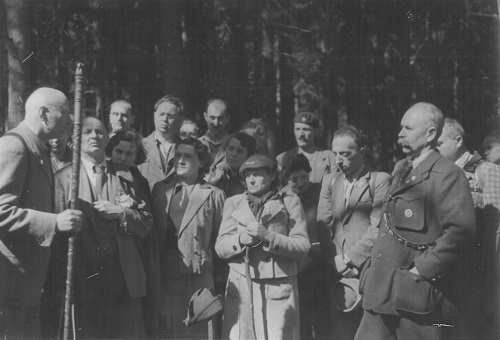 The Hungarian Ramblers’ Association decided to inaugurate the trail in the spring 1938 in the frame of a big hike. The name of the hike was Szent István Vándorlás (Szent István Wandering). Szent István was the first Hungarian king between 1000 and 1038. The whole country commemorated about the 900th anniversary of his death in 1938, and it was a good background to this big event. The original Blue Trail map shows the oldest route of the Blue Trail and it was published by the Association before the hike. 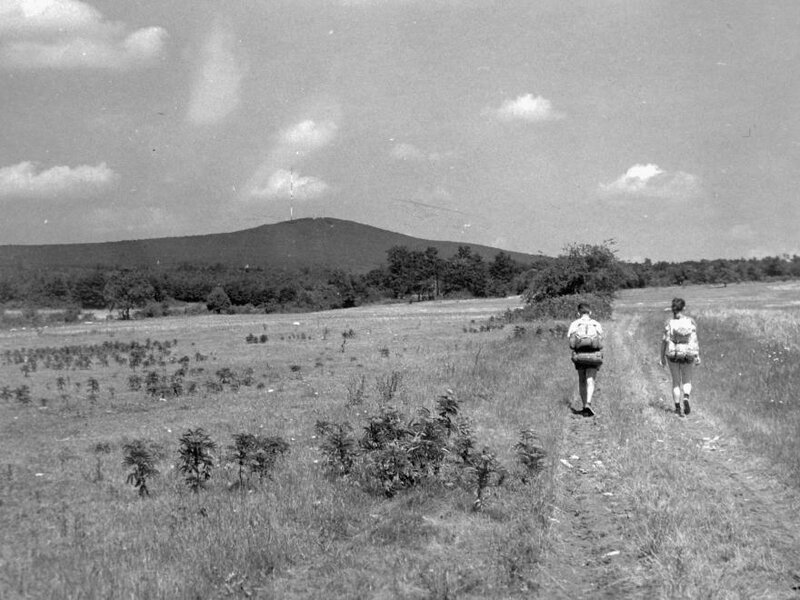 The final time schedule of the hike was published in February 1938, and according to this time schedule two teams started in opposite direction from the two ends of the Blue Trail, the first team began the hike at 20th March from the Írott-kő Mountain, the another team departed one week later from the top of Tolvaj-hegy Mountain in the Zemplén Mountains. The two teams walked continuously every day and met with each other on the top of Dobogókő Mountain, close to Budapest at Pentecost. 853 hikers of 45 hikers’ organisations participated on this hike. The Hungarian Ramblers’ Association planned to repeat this long hike in every five years, but in 1943, during the World War 2 it was postponed. The next memorial hike was organised only fifty years later, in 1988 and its name was Szent István Emléktúra (Szent István Memorial Hike), but everybody called it as Second Szent István Wandering. After the World War II the borders of Hungary were closed by the “Iron Curtain”, the hikers couldn’t visit other countries to organise hikes abroad. The leaders of the Nature Rambler Section of the Lokomotív Sport Club of Budapest looked for a new challenge for its members, which served the frequently sport activity and the participants could get to know better Hungary during its completion. So they announced the walking along the Blue Trail. The time schedule of the sport club based on the hikes along the Blue Trail in 1952 and 1953, this meant the completion of the trail between Tapolca town and the Tolvaj-hegy Mountain. The 852 km long route contained 25 sections. The participants could obtain a small badge after the completion of 15 sections and the “big” Blue Trail badge after 25 sections. The Locomotiv Sport Club extended this movement in 1953 for all railway employee hikers and published the first Blue Trail booklet with the map sketches about the whole route of the Trail. But the interest among the non-railway employee hikers was growing continuously, so the leadership of the Locomotiv Sport Club decided to give badges for the completion of the whole Blue Trail to all organised hikers. 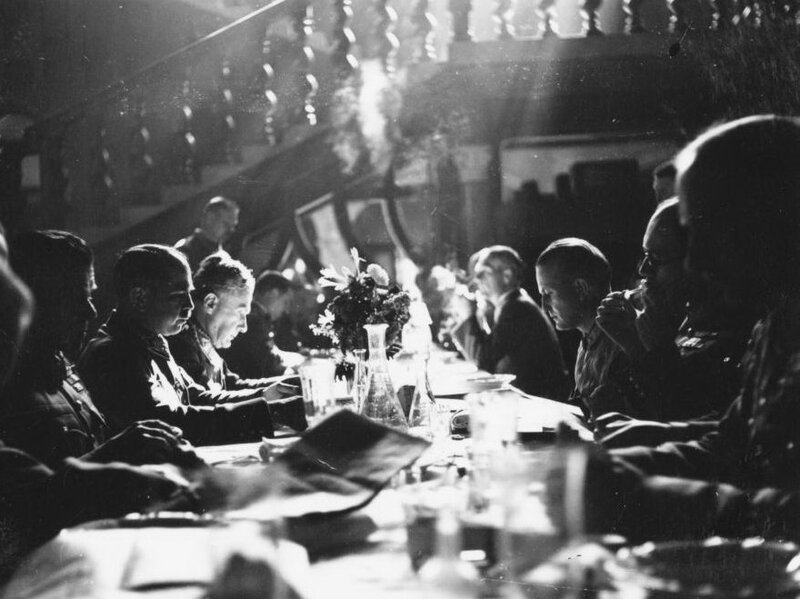 But at the beginning of the 60’s the Locomotiv Sport Club already wasn’t able the lead the big administration, so the organising and controlling of the National Blue Trail movement was taken over to the Hungarian Rambler's Association with regard to the big attendance. The Association extended the movement for every organised and non-organised hikers, too. The hike along the Blue Trail was very popular, and the Állami Könyvterjesztő Vállalat (National Book Distribution Company) issued the first travel guide book with coloured map attachment in 1964. Its name was: Az Országos Kék-túra útvonala mentén (Along the Route of the National Blue Trail). You can see here the map of the book. In the 70’s the Hungarian Ramblers’ Association elongated the route of the National Blue Trail until Velem, to the small village at the foot of Írott-kő Mountain. Unfortunately the closed Austrian-Hungarian border and the “Iron Curtain” obstructed the finish of the route on the border! This time the Blue Trail was already very popular among the hikers, but the average people hadn’t a clue about this thing! But it has changed in 1979. 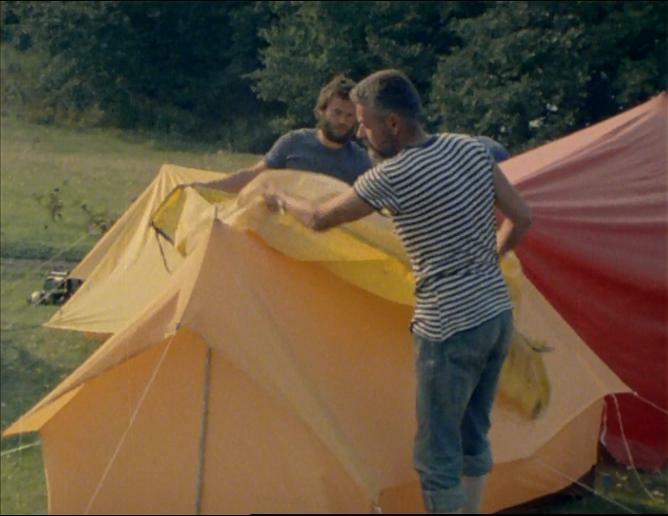 A well known Hungarian TV director and editor, Pál Rockenbauer decided to perform this hike during a two and a half months long continuous walk, as the leader of a small movie maker team. They made a TV series from their experiences and the Hungarian TV broadcasted it in 1980. Only the “National” Hungarian TV existed in that time, so millions of people watched the 14 episodes of the series on TV. The Blue Trail movement became a very popular thing, more thousand people began the hiking in that time. I think, almost every Hungarian hiker has this series on video or DVD at home! The title of the series was “Másfélmillió lépés Magyarországon” (One and a Half Million Steps in Hungary). But the story didn't finish here. Some years later Pál Rockenbauer and his small team continued the hike from the Austrian border and walked about 600 kilometres until Szekszárd town mainly on unmarked paths and dirt roads. His plan was to found a long distance path round in Hungary. They filmed their hike, but Pál Rockenbauer died before the premiere of the newer TV series. The title of this series was “Még egymillió lépés...” (Farther One Million Steps...). The new hiking trail was born with the collaboration of the Hungarian Ramblers’ Association and the local hikers organisations mainly on the route of the team. The name of this path is Rockenbauer Pál Dél-dunántúli Kéktúra (South-Transdanubian Blue Trail named Rockenbauer Pál). Some years later was born the third section of the big Blue Circle: the route of the Alföldi Kéktúra (Blue Trail of the Plain) was marked in 1996. Since that time hikers can walk around Hungary on the three sections of the Blue Circle: on the paths of National Blue Trail, South-Transdanubian Blue Trail and the Blue Trail of the Plain. But it is indisputable, the most popular section of the Blue Circle is the National Blue Trail. According to the decision of the EWV (Europaiche Wandervereinigung) the National Blue Trail is connected to the net of European Long Distance Hiking Paths. Therefore first the section between Kőszeg town and Budapest, and since 1995 the section between Kőszeg and Sátoraljaújhely town (it is about 95% of the whole route of the Blue Tour) has been being a part of the E4 Hiking Path. A big part of the South-Transdanubian Blue Trail and the Blue Trail of the Plain is a part of the E7 Hiking Path. 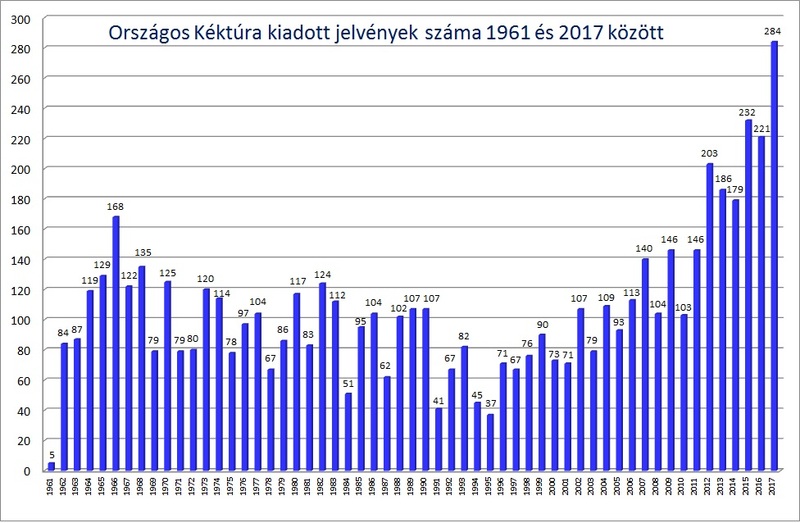 The Hungarian Ramblers's Association keeps a record about the hikers, who have reported the hike completions and demanded the Blue Trail badge. It seems from the chart, that the number of the completions have been growing constantly since the millennium. There are several explanations about this thing, but I think, its reason is simple the information revolution. The fast Internet have spreaded together the growing number of the hikers completing the National Blue Trail! According to the record of the Association there are hikers from Austria, Belgium, Germany, Netherlands, Slovakia, and Uzbeghistan, who handed over the badge of the Trail! Finally I would like to show you three maps. The first one was publicated in 1938 and it shows the original route of the Blue Trail before the inauguration. The second map was published with the first National Blue Trail Guide Book in 1964. If you compare it with the original map, you can see, the route had changed at many places! The first big change happened at the Balaton Lake, after the diversion the National Blue Trail leads on a more northern route, but the original route is preserved with blue strip trail blazes. The name of this route is “Balaton-felvidéki Kéktúra” (Blue Trail of Balaton-felvidék Region). The second big change was in the vicinity of Budapest, now the Blue Trail visits the capital with a big loop. The third map, which shows my route on the National Blue Trail, was surveyed in 2011-2012 with my GPS, does not show big changes in the past 50 years, the route of the trail changed only on shorter sections. The size of the downloadable map is 2781 kiloByte! It will be open on another page. The size of the downloadable map is 4344 kiloByte! It will be open on another page. This map shows my route, which was surveyed in 2011-2012 with a hiker GPS. The blue dots are the stamping places along the route. The size of the downloadable map is 3517 kiloByte! It will be open on another page. The name of the hosting provider: Port Kft. The postal address of the hosting provider: 9200 Mosonmagyaróvár, Szent István király út 60. The information on this website is true and complete to the best of the author's knowledge. All recommendations are made without guarantee on the part of the author. The author disclaims any liability in connection with the use of this information.